Here's another "green" idea for St. Patty's Day, but quite a bit simpler than those previously posted. This idea is a relative of love coupons, with it's own twist. First, you'll hide these little "Clover Cash" cutouts around the house in places that hopefully only your husband will find. If you have kids, you'll either need to let them in on the secret or be more creative in hiding them. Give your husband a Clover Cash Card which tells him what his clovers are redeemable for. Need ideas of where to hide the clovers? Inside a book your love is currently reading. Behind the car sun visor. Taped to their favorite beverage. The bottom (outside) of a clear glass. Taped on the backside of the remote control. Inside their wallet or purse. Laminated in a bubble bath. Tucked in a pet's collar. Very large, taped on an outside window. Attached to your love's key chain. On the ceiling, above your bed. Inside a CD or movie sleeve. In their work briefcase or bag. Tucked in a toilet paper roll. In a box of their favorite snack. See, that's simple, fun...and cheap! No purchase required. Enjoy! Good and simple! I love it! Thanks! Cute, cute, cute! I love this idea!!! SUCH a great idea! Just printed and cut out everything!!! Ready to start this evening!!! Can't wait! THANKS! Cute idea. You know, you could even do this for Easter as well. Since an all-out Egg Hunt is generally tradition anyway, you can use eggs as your "cash." LOVE LOVE LOVE this idea! Clovers are hidden and ready to go! You have the cutest ideas. I LOVe your blog. Thanks for all the good ideas. Thanks for all your sweet comments! And thanks Tara for thanking me for the download. To be honest, it sure is nice and I really appreciate the thank you's--but seeing it downloaded 50 times, knowing that even 50 couples can have a little fun and grow in love and romance because of this idea... that makes me really happy. I know it sounds cheesy, but it's true. (I can't believe I'm admitting it, actually...hopefully no one comments LESS because of it..) hehe! You're all great! Love this idea! Clovers cut out and hidden! So excited to share with my hubby! Thanks a million for all the awesome ideas!!! what a fun idea. I'm your newest follower and look forward to looking through your blog. cute, cute!! Thanks again- you're always FULL of fun ideas. I don't know if my e-mail is going through to you about my dress size and address for the shabby apple give away. If you haven't yet received an e-mail from me, would you do me a favor and comment on my blog or e-mail me to let me know? I'm just so exicted for this dress, and would hate to miss out because of a lost e-mail! Thanks! This was such a fun idea, and my husband has actually gotten really into finding the clovers. Keep up the great blog! I just did this with my husband, yesterday. I was thinking it would be something that would last all week, but imagine my surprise when I came home to find out that he had combed the house while I was gone and had already found 10 of the 12! And I thought they were good spots... We've been having so much fun with this! Thanks for the idea! Lovin' your blog. Thanks for this one - I'm totally doing it! Thank you! I have already downloaded the clover file so that I can do this for my hubby. I REALLY appreciate it! What a cute idea - I would have never thought of that! 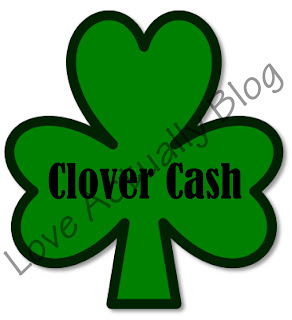 I wanted to let you know I did the Clover Cash idea at home, we called it the "Shamrock Hunt." And it went over great! At first I wasn't sure how Husby felt about it. Then he let me know through a blog post. I did this for my husband this St Patrick's Day and he loved it! He's still looking for one of the clovers though. Fun, cute and completely free - brilliant. Thanks!